Today's new or used car buying experience is more convenient than ever, especially when you choose to use SnoCope's AutoSMART application. SnoCope’s dynamic car shopping site has all of the tools you need to guide you through the entire process of buying a new or used car. From finding to financing SnoCope’s AutoSMART saves you time and helps you make an informed car buying decision. Narrow down your search criteria faster. Determine if the car you've found (make model and price) truly fits your needs. Determine if the price is fair. be able to submit a loan application for an instantaneous loan result and get pre-approved. SnoCope’s site even includes research tools to help you determine the value of a used car like free value guides through NADA. And some dealers have the capability of providing Car Fax reports which give you the history on the particular vehicle at no charge --- but you can purchase Car Fax reports on the site if you choose to do so. Estimate what you can afford and your monthly payment. Find CUDL (Credit Union Direct Lender) dealers near you. apply for a loan directly from SnoCope, plus a whole lot more. 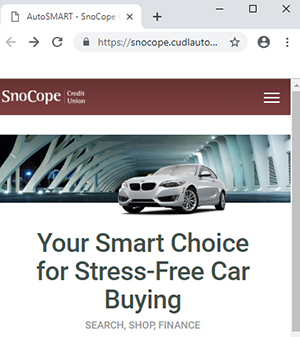 With SnoCope’s AutoSMART you can shop for any make and model of vehicle right from the comfort of your home on your own computer or from your personal handheld, mobile device. You no longer have to spend precious time driving from dealer to dealer, or browsing multiple websites to compile information and locate the car you’re interested in.